When you're asked math questions during a retail job interview, the interviewer wants to know that you have basic math skills, even though the cash register may automatically calculate the change for you. Here are tips to help figure out the correct change and estimate discounts and tax when a customer purchases merchandise. When you are making change for a cash purchase, even if the cash register does the math for you, always count the change back to the customer. Example: The customer makes $23.78 in purchases, and gives you $30.00. You count back to the customer: "22 cents makes 24 dollars, 1 dollar makes $25, and 5 makes $30." Example: The customer makes $11.56 in purchases, and gives you $15.06. You count back to the customer: "50 cents makes 12 dollars, 1,2,3 dollars make $15." You don't need to say it aloud, but count it out (at least in your head) while you are making change. You will make fewer mistakes this way. If you're asked about keeping cash in the register and what bills to use for making change, explain that you understand that it’s important to make sure your register is well stocked. 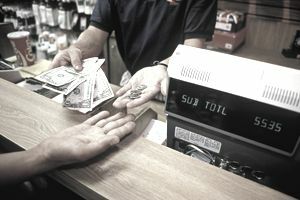 Retail establishments always set a base amount of money they need to keep in a cash register (typically $200) but it can vary based on a retailers average daily sales. It’s important to keep adequate amounts of the most commonly used bills (1-dollar and 20-dollar bills) on hand. Whenever possible, you should also make change using bills of the highest denomination so that you don’t exhaust your supply of 1-dollar bills. When making change, it's best to use the largest denomination bill you can. Less counting is less opportunity for mistakes in counting (or having bills stick together). Example: A customer wants to know the price of an item that is regularly $39.99, and it's 30% off. Round up to $40.00, 10% would be $4.00, times 3 would be 30% and $12.00 off. $40-$12 is $28. Example: The regular price of an item is $70, and it's 25% off. 10% is $7.00, times 2 is $14, plus half of 10% is 5%, or $3.50. 25% is $14+$3.50=$17.50. $70-$17.50 is $52.50. Another way to look at 25% is to call it 1/2 of 50%. 50% of $70 is $35, so 25% is $35 divided by 2, or $17.50. $70-$17.50 is $52.50. Example: An item costs $140, and the tax rate is 8.25%. 5% would be $7.00, plus (a little more than half again ~3%) approximately $4.00 is $11.00. $140+$11 = $151.00 for the approximate total cost of the item, tax included. You may be asked about calculating discounts for a customer. To give an easy, quick estimate of a percentage off, figure 10%, and multiply by the tens. This may not be an exact number, depending on the change, but it's close enough to give a good estimate. Tax can be estimated in the same way. Go with 5 percent and 10 percent, and you can get a number close enough to help a customer decide if they want the item. Again, the actual cost may be a little different, but your estimate is able to help the customer make a more informed decision about their purchase. Making some simple calculations in your head when you are checking out customers will help you to catch silly mistakes that can be avoided. If you know that the purchase is that $70 item at 25 percent off, and your register reads $27.32 as an amount due, you're going to know that something went haywire, and you can fix it before the customer leaves the store. Paying attention to the details is what makes a superior sales associate and that's what interviewers are looking for when they ask math questions during a job interview. They not only want to be sure you can do the math, but they also want to make sure that you can estimate pricing, if necessary.